could make a few to tuck away until needed! January 25, 2011 / Annette / Comments Off on Mitten weather! Today we did a just-for-fun winter craft. and had fun decorating their mittens. From the Everyday Waldorf archives! bow around the “neck” and made a top hat from black construction paper. I’ve been feeling the need to do something crafty, but with newborn twins and all, it’s difficult to find projects that are easily picked up and put back down. I’m a knitting drop-out but I remembered I wanted to try my hand at crochet. I found some You Tube videos and am ready to start some beginner projects. Wish me luck! What are you making this week? I want to be crafty. Really, honestly, truly, I do. I don’t know if it’s lack of skill, lack of innate ability, or lack of confidence, but much as I would like to be a arts and crafts kind of girl, I’m just not. I seem to have a predisposition to not following instructions. When this is accompanied with a general lack of talent, the results just aren’t pretty. This morning the older kids all made a gift for Daniel, who is obsessed with football. 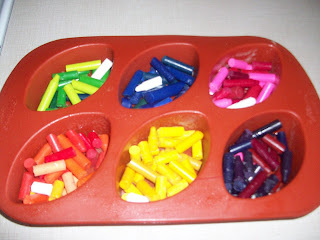 First, we peeled and broke up little bits of crayons, being careful to keep crayons in the same color family. We used a silicone football mold, but any mold or muffin tin would do. Spray with cooking spray first! 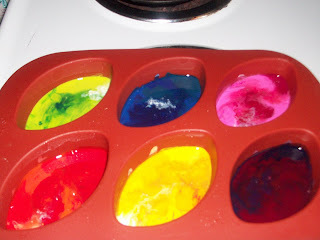 We turned the oven to 275 degrees and baked the crayons until they melted, about 10 minutes. We put them into the freezer to cool them down. We didn’t quite wait long enough–the red and pink crayon got a little boogered up– but we just couldn’t wait to pop them out! 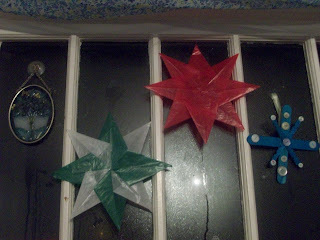 Nicholas and I enjoyed making window stars this morning. You can find a simple tutorial here. 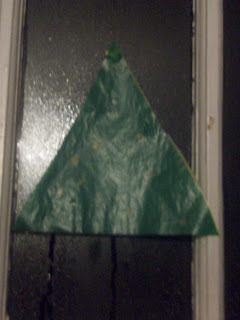 He then made a Christmas tree transparency by using star and hole punches to punch holes in a Christmas tree and then gluing a sheet of yellow kite paper behind it. It looks beautiful in the sunshine, but unfortunately, all we got was a rainy cold picture! While working on the Advent book- and it’s almost done! 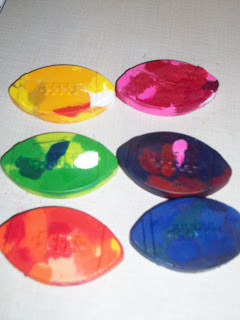 YAY!- I suddenly had a brainflash about my dirty beeswax crayons. Complete non sequitor, I know. This is the way my brain works.